Appealing to the romantic at heart, the seclusion of this lodge creates a natural sanctuary where guests can experience a haven of wildlife, breathtaking natural beauty and an intimate relaxation experience. Be greeted by the knowledgeable service team with a genuine warmth and friendliness that is intrinsically woven into the fabric, resulting in a relaxed and pleasurable experience that can best be described as … Ruffles Lodge. And all conveniently located only a short 25 minute drive from the Gold Coast and an easy 40 minute drive from Brisbane, Ruffles Lodge is perfectly placed for your next escape to a romantic hinterland haven. 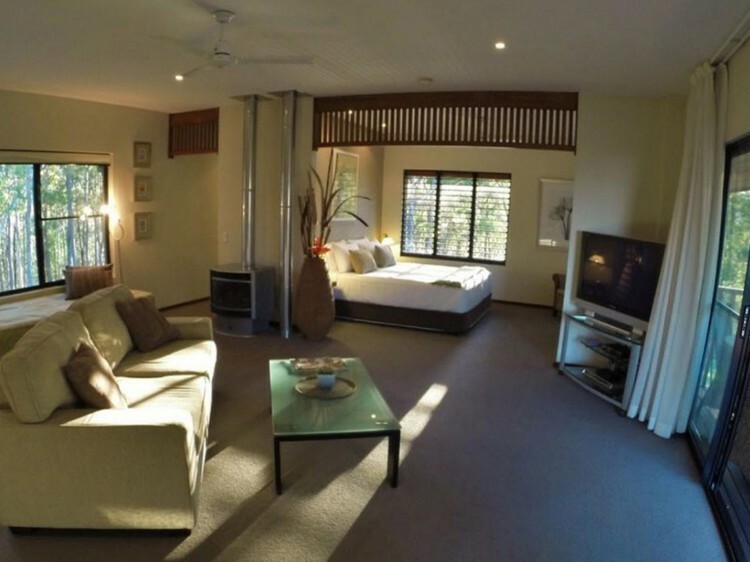 Lodge Studio Suite - conveniently attached to the main lodge and within easy reach of the restaurant and infinity pool, this studio style unit is a lovely little delight. Best suited as an accompaniment to the neighbouring Executive Suite for the larger guest parties. The balcony has overlooking views of the coast which we are so famous for. The plush interior has a deluxe king bed or two single beds and ensuite bathroom with shower. This little suite would suit the budget conscience or couple just looking for a quick easy getaway. Room size: 25m2. Executive Suite - the plush opulence of this suite is perfect for honeymoons, special occasions or an exclusive retreat. This private and spacious One Bedroom Suite boasts spectacular hinterland and coastal views, its own 270 degree wrap around balcony and manicured garden. The separate lounge and bedroom ensures quiet privacy whilst your loved one is relaxing, or perfect for the extra staging room during special occasions. Room size: 86m2. Owners Villa - originally a private home for the owners of Ruffles Lodge & Spa, this Two Bedroom Villa offers spectacular views across the Hinterland and out to the Gold Coast. Ideal for a family or group of friends, the Villa has been meticulously furnished and decorated to blend in with the surrounding landscape. The Villa has a fully equipped kitchen and dining room. For the personalised touch, prepared and served exclusively, from the luxurious comfort of in-villa dining by the chef offering that extra special touch. Room size: 140m2. 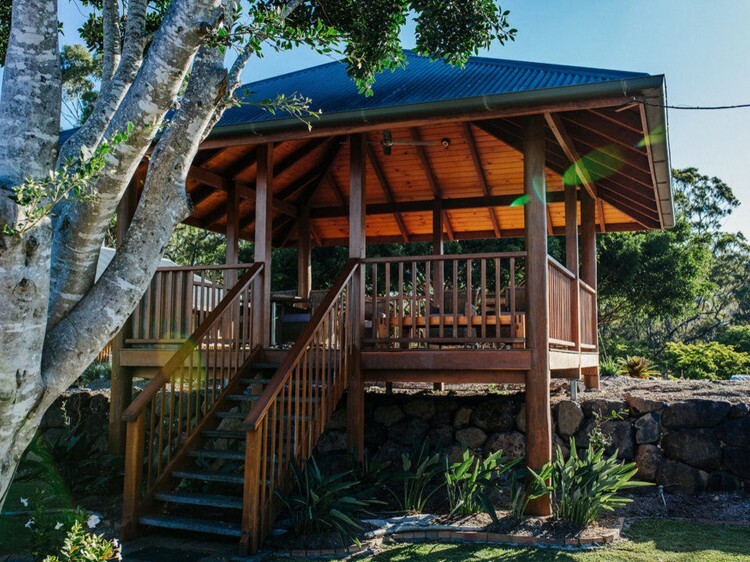 Treehouse Villa - this romantic hideaway is the most secluded of our villas, these 'pole house' style One Bedroom Villas are situated 200 metres from the main lodge, with breathtaking views across the Gold Coast Hinterland and coast. Luxuriously boasting a plush deluxe king bed, wood burning fireplace, deep soaking bath tub, a private outdoor deck with plunge pool. Room size: 80m2. 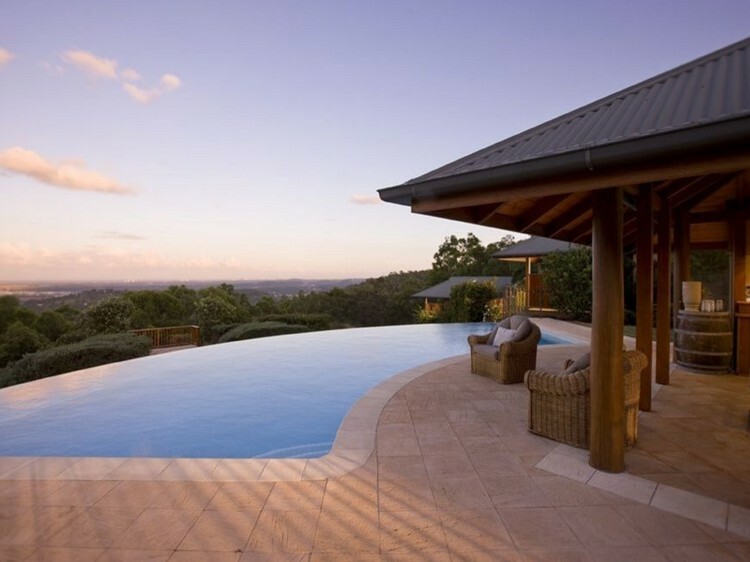 Garden Villa - with superior 180-degree views across the Gold Coast Hinterland out to the Gold Coast Broadwater and beyond these superb villas, although separate from the main lodge, are the closest conveniently located next to the Infinity Pool. With their own private balcony to capture the majestic views, deep soaking bath tub to melt the stress, and every conceivable amenity. Here is a place to relax and reconnect. Room size: 61m2. Chums Villa - boasts a forest outlook with views to the north of the coast, out over the gardens and through the eucalyptus forest to the south. With a wrap around balcony and day bed to soak in the sun, or the couples jetted deep soaking spa bath, this spacious villa comes with a wood burning fireplace to set the mood for an intimate relax. Room size: 63m2.